DARPA, the US Military’s research arm, has revealed it’s one step closer to achieving its goal of an implantable human memory prosthesis – just one of several dystopian-sounding projects in the pipeline. However, not all of the agency’s developments have been weapons in the traditional sense – DARPA has also been credited with contributing to the creation of the internet and the development of GPS. Currently, several unsettling futuristic technologies, involving militarizing the environment and manipulating the human body and brain are under development at the Department of Defense’s “mad science” division. Here RT looks at some of the ways the unit is utilizing AI and genetic engineering in the name of national security. DARPA has invested heavily in brain technologies since 2013 when it unveiled its BRAIN (Brain Research through Advancing Innovative Neurotechnologies) initiative, consisting of several programs dedicated to making “revolutionary” advancements in neuroscience. These technologies are something of a double-edged sword, holding the potential for rehabilitation but also stand the risk of being applied unethically. “The brain is the next battlespace,” James Giordano, a neuroethicist at Georgetown University Medical Center previously told Foreign Policy. Neuroscientists have warned of the ethical issues around such developments. In 2013, the same year BRAIN launched, a group of scientists confirmed they had successfully implanted false memories in a mouse’s brain. 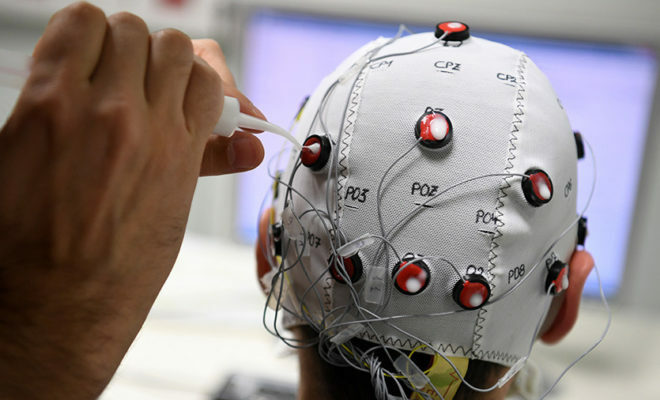 Among other brain hacking technologies in development is a human memory ‘prosthesis’. DARPA recently reported it was on track to achieving this implantable brain chip that would facilitate the formation of new memories and retrieval of existing ones in individuals who have lost these capacities as a result of traumatic brain injury or neurological disease. Brain chips are also being examined by DARPA-funded researchers as a way to treat PTSD by deep brain stimulation. They are looking at sending low doses of electricity deep into the brain in order to alter a person’s mood. Meanwhile, DARPA is also seeking to advance human capabilities by speeding up skill acquisition. If this project is a success, the result will be ‘downloadable learning’ – allowing military personnel to acquire necessary skills without lengthy efforts. And, if that wasn’t enough, a potentially-dystopian technology is being harnessed by DARPA’s NESD (Neural Engineering System Design) program to enable direct communication between the brain and computers. The goal is for the brain computer interface to be capable of two-way communication – receiving signals as well as transmitting them back out, by recording signals from 1 million neurons. In another ambitious venture DARPA is researching how to save wounded soldiers by putting a temporary halt to biological time. The Biostasis project aims to slow biochemical reactions inside cells so as to extend the window of time between injury and first medical treatment – a window which can determine whether a person lives or dies. The plan is to leverage molecular biology to develop new ways of controlling the speed at which living systems operate. It is pursuing various approaches to slowing down biochemical processes in living cells without damaging them. From plants to plankton the natural environment appears to be awash with opportunities for a military agency looking to extend its surveillance program. DARPA’s Advanced Plant Technologies (APT) Program is hoping to turn trees into spies by genetically engineering plant-based sensors and monitoring them remotely. The plants will be able to “detect the presence of certain chemicals, pathogens, radiation, and even electromagnetic signals,” and by doing so keep the US military out of harm’s way. Sea creatures are also the focus of a project hoping to utilize oceanic organisms as sensors to track an enemy’s undersea vehicles. DARPA is looking at mollusks, crustaceans and certain types of fish to see which are most suited to support a sensor network monitoring threats to US naval vessels. Endangered species and intelligent mammals, such as dolphins and whales, are excluded from the program. Todd Kuiken a senior research scholar at the Genetic Engineering and Society Center at North Carolina State University has raised concerns over a synthetic biology experiment of this sort being funded through the Department of Defense. “Because the US is funding these initiatives through the Department of Defense, rather than a civilian organization, it’s not hard to see how some in the international community may perceive these as potential bioweapons programs, rather than investments in purely defensive technologies. “After all, if the US is able to engineer an insect to carry a virus for protective purposes, it wouldn’t be hard to engineer that same insect to carry a deadly virus for offensive ones. It’s a classic dual-use technology scenario,” he wrote in Slate. DARPA is no stranger to controversy – particularly for its role in the Vietnam War where it introduced Agent Orange onto the battlefield. The potent herbicide was used by US military forces to eliminate forests and crops used as cover by North Vietnamese and Viet Cong troops. It was later proven to cause serious health issues — including cancer, birth defects, rashes and severe psychological and neurological problems affecting locals and US veterans. The organization has an annual budget of around $3 billion – a request of $3.17 billion has been made for 2018 and increased to $3.44 billion for 2019.